Weighty Matters: Gerber Graduates wins the dubious 2010 Salt Lick Award! Gerber Graduates wins the dubious 2010 Salt Lick Award! "Together, Nestlé & Gerber have made an unwavering commitment to a healthier generation, one baby at a time. It’s our pledge to support the healthy growth and development of babies around the world. And, you’ll see this commitment in everything we do - bringing you and baby innovative and trusted feeding solutions from birth through preschool, and everything in between"
So together what have Gerber and Nestlé brought? Salt. Lots and lots of salt. 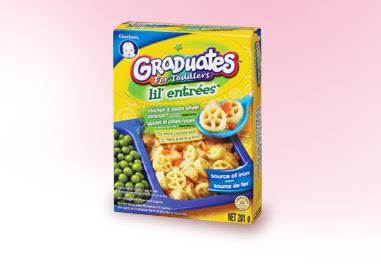 This morning the Canadian Stroke Network and the Advanced Foods and Materials Network announced that the Gerber Graduates toddler food product line won the 2010 Salt Lick Award. So how much salt we talking? Looking at Gerber Graduates Chicken and Pasta Wheel Pickups we're talking 550mg of sodium, more than half a toddler needs in a daytime and the equivalent amount of sodium found in 2 orders of medium fries at McDonald's. Guess they're trying to graduate them to full blown heart disease. Great job Gerber and Nestlé, your caring for kids is truly blogworthy.